Playing a male gynaecologist involved in a messy divorce in his upcoming drama, “To Advance Towards Happiness” has made Nicky Wu afraid of getting married. According to Sina, while speaking to the media in Beijing on 8 January, Nicky revealed that he had a slight fear of marriage after experiencing how bad a divorce battle can be, but denied that it will affect his relationship with girlfriend, actress Cecilia Liu. “Drama and life are two different things. Don’t read too much into my fear of the topic,” said Nicky. When asked about his own relationship to the “Bu Bu Jing Xin” star, Nicky admitted that he is not a hopeless romantic when in love. “We have never quarrelled, so there is no question on who should apologise first. But we had yet to buy a ring for each other,” said the actor. Meanwhile, his upcoming drama, “To Advance Towards Happiness” is the third and final instalment following “To Advance Towards the Fire” and “To Advance Towards Victory”. In the movie, Nicky will be caught in a love triangle involving two women, played by Cica Zhou and Tang Yuhong. Nicky Wu Living With His Onscreen and Real Life Leading Lady Cecilia Liu In Her Apartment? 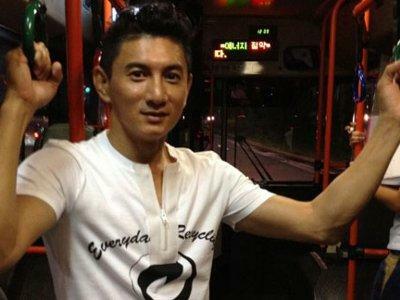 Rumour has it that actor Nicky Wu has moved in with his girlfriend, actress Cecilia Liu. As reported on Apple Daily website, a source close to the couple claimed that the actor has taken the relationship one step further by living together with his onscreen and real life leading lady in her apartment located in Shanghai. The source claimed that Nicky has moved in earlier this month, long before the paparazzi caught him going to her house, which eventually led to his confession about their relationship. It was said that Nicky has decided to move in with Cecilia to spend more time with her, after realising that he will be too busy with work to find time to meet. Meanwhile, Cecilia’s manager stated that the agency is in no position to comment about the actress’ personal affairs.